And it’s getting worse :(. The air was thick when Mom, Krishnan and I went for a walk around 7.30 am. 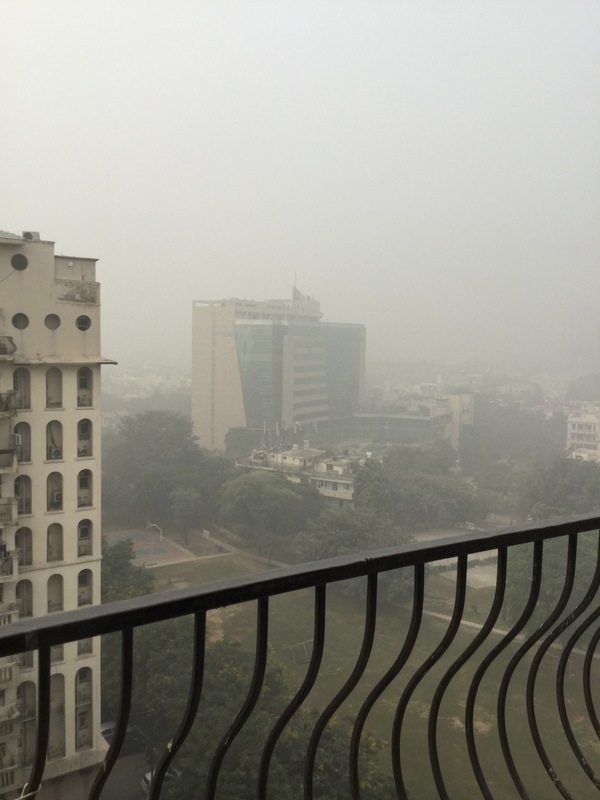 There are no crackers being burst, and no Diwali around the corner but still the smog descends. What is being done to solve this issue ? Can the honourable Supreme Court intervene now ? Can the Central govt and the incompetent-Yugpurush CM of Delhi work together to resolve this health hazard ? 1. There are trees and plants that can be planted which will help – why not plant the Tulsi all over the city ? Rather than the infamous “keekar” and useless Eucalyptus, can other shrubs or trees be planted ? Actually can some grown trees be “transplanted” from other cities where they are being cut down ? 2. Why do farmers have to burn the wheat stalks …. aren’t they good for cattle fodder ? 3. Can all construction work be stopped for three months ? 4. Stop new car sales temporarily – let people use public transport. Yes even the Delhi elite. Import electric buses if need be to tide over this season. 5. Ban cutting of trees in Delhi NCR. Only transplantation must be allowed. If with my limited knowledge I can come up with 5 ideas am sure smarter and better people can come up with several more. On an aside Taimur’s mom is peddling a “Pallution” buster from Honeywell…. can Honeywell build a mega “Pallution” buster for Delhi NCR ? Get paid for it but at least make an attempt. Is it not planting Tulsi is communal and spread safron jihad? 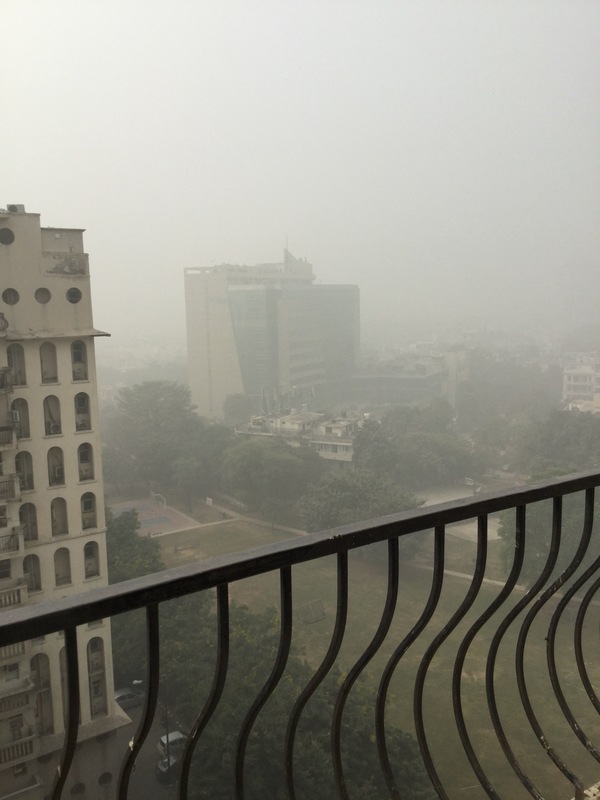 Wow – I was there last year just before Diwali and was surprised by the smog but this looks a bit worse, even. How does it tend to be in February? I’ll be spending some time there then. I completely agree with your suggestions. I’m a huge fan of public/communal transportation and active transportation. Not only do those help the environment, when used enough, they clear the roads for those who have to drive. It is a win/win situation for everyone. February should be ok Todd. This is usually a couple of weeks in November. This year has really been bad. I recently read a blog on another site that says India’s push for industrialization is also turning it into a major polluter. I’m a big fan of public transportation, too, and wish it were more user-friendly here. Because of the over-reliance on the private car in the US, public transportation in most places is terrible. Old, dirty buses, bad schedules, bad routes, no public or private support. China is looking into the pollution problem, I guess, finally. They are building waste-to-energy plants and getting more involved in green technology. Katharine, the industrialization push that’s happening now is with a lot more environmental sensitivity. We have traditional industries that are huge polluting like the dyeing units, the chemical factories, and we have the “plastic” problem. In my growing years, my parents would carry cloth bags to the market and buy dry groceries wrapped in a news paper or brown paper and vegetables etc would be bought in the cloth bag directly. Then plastic bags came in about twenty years back and its an epidemic. Our landfills are plastic-fills – people go out to buy one orange and even before paying for it, they ask for a plastic carry bag to put the orange in !! I have gone back to my cloth bags for the past 5 odd years, and I am almost maniacal about it. The poor in the cities just burn plastic now because firewood is not available and plastic is free. We also don’t plant enough trees to replace the ones we cut to build roads and houses. So its a problem that has to be attacked from several angles – the first of which is to make India plastic bag free. The poor burn the plastic? How that must worsen pollution. The smell of burning plastic is horrible. Like you, I’m a fanatic for using canvas, re-usable shopping bags. As you know, I don’t like mandates, and believe in setting a good example instead. “Make it as easy as possible for people to do the right thing,” I claim. A good business for entrepreneurs would be to make and sell attractive shopping bags. I’ve used upholstery fabric remnants, which are inexpensive here. If I liked sewing, I would make more. I thought Taimur was the famous Mongolian King (Tamerlane). But apparently you are not referring to him. Duh- I’m a little dense (and I can’t blame the Delhi fog for it). Please explain. Aaj kal sare Hindustan mey FOGG chal raha hai! Hahahahaha FOGG hi chal raha hai Kaushik Ji. Taimur ki mummy is Kareena Kapoor :). Kareena and Saif Ali Khan couldn’t find a better name than the plunderer for their son…. hope he doesn’t live upto his (in)famous name.